Biography of Italian Renaissance Terracotta Sculptor. now in Pinacoteca Nazionale, Bologna. An influential figure in Italian Renaissance Sculpture, Niccolo Dell'Arca (aka: Niccolo da Ragusa, Niccolo da Bari and Niccolo d'Antonio d'Apulia) was famous for his expressionist clay sculpture, which he created by combining the techniques of northern Gothic realism and the compositional principles of Renaissance art. Preferring to work with terracotta, his most important contributions to the Italian Renaissance are his sculptures Lamentation over the Dead Christ (1463, originally for Santa Maria della Vita, Bologna but now in the Pinacoteca Nazionale, Bologna) and Madonna and Saints (1478, entrance to Palazzo Comunale in Bologna). Born in either 1435 or 1440, Niccolo dell 'Arca's place of birth is not certain. He may have been born in Apulia or Bari, although some art historians suggest he could have been of Slav origin. He was originally known under the names of Niccolo da Ragusa, Niccolo da Bari and Niccolo d'Antonio d'Apulia, but became known as Dell'Arca after completing the tomb of St Dominic at the church of San Domenico, Bologna ('arca' is Italian for tomb). It is thought that Niccolo moved to Dalmatia (now modern day Croatia) some time in his early teens and learned the art of sculpture under the Dalmatian sculptor Giorgio da Sebenico. Other historians believe he worked with the Catalan sculptor Guillem Sagrera in Naples on the triumphal arch of the Castel Nuovo; while others contend he travelled to France and Siena where he may have been influenced by the works of Donatello (1386-1466) and Jacopo della Quercia (c.1374-1438). The first record we have of Niccolo dell'Arca appears in 1462, where is described as a 'master of terracotta figures'. This comment probably refers to his work at the church of Santa Maria della Vita in Bologna. This is a life-size painted terracotta set of six figures that are standing around the body of Christ, lamenting his death. 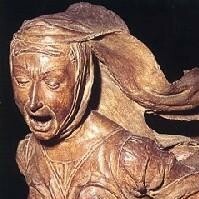 The figures are carved in dramatic postures, their faces etched with expressions of grief and torment. It is a highly realistic artwork, which would have been a credit to any Expressionist sculptor of the 20th century. This group of six life-size standing figures was installed in the Santa Maria della Vita church in Bologna. Niccolo dell'Arca's treatment of drapery - taken from classical Greek sculptors - is especially dramatic here, with the robes of the grieving women flying out behind them. The size of the figures around Christ's dead body, together with their realism and their distressed states would have made this installation a heart-stopping sight for worshippers in the church. It was the use of terracotta, as opposed to marble or bronze, which allowed the artist to create more expressive works. This sculpture may very well have influenced a similar work - Lamentation (1492-94) by Guido Mazzoni, at the Church of Monteoliveto, Naples. To learn how to judge artists like the Renaissance clay sculptor Niccolo Dell'Arca, see: How to Appreciate Sculpture. In 1469 Niccolo dell'Arca won a commission to build an ambitious new addition to the tomb of St Domenic (Arca di San Domenico) at San Domenico, Bologna. The tomb was a huge spiral structure with several free-standing figures on top of the sarcophagus. The sarcophagus contained the remains of Saint Dominic and had been sculpted two centuries before by Nicola Pisano and his apprentices (1265-67). It was completed by Arnolfo di Cambio and Fra Guglielmo Agnelli. Niccolo's job was to add an additional spire and set of statues. He created a statue of God the Father, which was set on top of the candelabrum and supported by two putti (angels) and four dolphins (all covered with festoons and fruit). Niccolo continued to work on the project until 1473, working on it intermittedly thereafter. The monument shows influences of several different Renaissance sculptors: the lower part of the superstructure was surrounded by free-standing sculptures, some created by Niccolo, but then finished by a young Michelangelo in 1494. Art critics view the tomb as a masterpiece of blended influences: Florentine, Burgundian, Gothic, and Renaissance. One example is the sculpture of 'Prophet Wearing a Turban'. The heavy, soft drapery handling of this figure is characteristic of much quattrocento (15th-century) Gothic sculpture and points to the influence of Northern Late Gothic sculpture, and more specifically to Burgundian sculpture of the circle of Claus Sluter.  Terracotta high relief of Madonna di Piazza (1478, wall of the Palazzo Comunale in Bologna). The influence of sculptor Jacopo della Quercia can be seen in the marked folds of the figure of Madonna, and her dynamic naturalism shows influences of Niccolo dell'Arca's contemporary Andrea del Verrocchio.  Terracotta bust of Saint Dominic (1474, Museum of the Basilica of San Domenico in Bologna). Marble statue of St. John the Baptist (Escorial, Madrid).  Terracotta figure of Saint Monica (c.1478, Museum Palace, Modena).